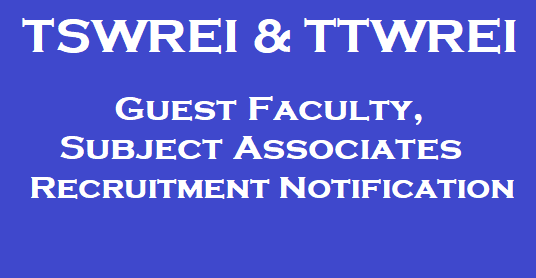 TSWREI & TTWREI Guest Faculty, Subject Associates Recruitment 2018 Notification - Online Application Form,Tswreis, Ttwreis guest faculty, Subject associates recruitment 2018, TS Social Tribal welfare guest faculty,Tswreis, Ttwreis Guest Faculty /Subject Associates Recruitment 2018 inTS Social, Tribal Welfare Residential Educational Institutions: Selection of Part time Guest Faculty/ Subject Associates in COEs of TSWREIS & TTWREIS 2018: It is to inform that, TSWREI & TTWREI Societies have converted certain institutions in to COEs for providing quality coaching to the JEE Mains/Advanced and NEET aspects to the children of poor families. In this regard senior subject faculty and subject Associates (Academic Assistant) @ 5 to each institution are required to work in the following COEs in Telangana State. a. Senior subject faculty: Rs. Depends up on their performance. b. Subject Associates: Rs. 25,000/-. 1. Candidates having Masters Degree with first class. 2. Minimum 5 years experience in teaching JEE Mains/Advanced and NEET. 3. Experience to prepare the successful candidates for JEE Mains/Advanced and NEET Exam. 4. Achievements, if any related selection of students in JEE Mains/Advance and NEET. 2. If any experience certificate in teaching JEE Mains/Advance and NEET. 3. If any experience to prepare the successful candidates for JEE Mains/Advanced and NEET Exam. 4. Achievements, if any related to selection of students in JEE Mains/Advance and NEET. 1. The selected faculty will have to perform all the Residential pattern duties assigned to them by the Principal. 2. Women faculty will be given priority to work in girls COEs. 3. Mere applying for the post shall not entitle the candidates for any claim to the respective faculty / subject associates. c) Deeper idea about JEE/NEET examination pattern. a. Senior Subject Faculty: The Senior Subject Faculty have to attend interview and Demo on 15.05.2018 at TSWR COE (B), Gowlidoddi, time 10:30 A.M onwards. 1. Interested Candidates have to apply through online for TSWREIS: www.tswreis.telangana.gov.in (or) www.tswreis.in. 4. Download of Hall Tickets (Subject Associates) 15th onwards to 16th May 2018. 7. Interview and Demo to be conducted to the qualified candidates (Subject Associates): 21st to 23rd May 2018.